We’re so glad you’ve stopped by to visit our website! At The Bridge Bible Fellowship, we want you to experience the great worship music, challenging messages from God’s Word, friendly people and enjoyable atmosphere that are a part of The Bridge. 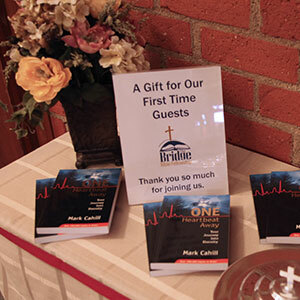 We know that your first time at a church, any church, brings up some questions. How do I get there? What should I wear? What’s available for my kids? What should I expect in church? The following section addresses some FAQ which we hope you find helpful! We hope to see you this Sunday! 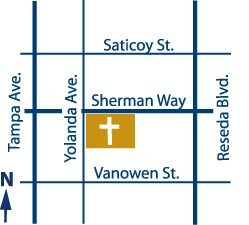 We are located in the San Fernando Valley on Sherman Way, just west of Reseda Blvd. From 101: Exit Reseda Blvd. Go North to Sherman Way. Turn left (West) on Sherman Way. Turn left (South) on Yolanda. You’ll enter the parking lot at the first driveway on the left. From 118: Exit Reseda Blvd. Go South to Sherman Way. Turn right (West) on Sherman Way. Turn left (South) on Yolanda. You’ll enter the parking lot at the first driveway on the left. From 405: Exit at Sherman Way. Go West. Turn left (South) on Yolanda. You’ll enter the parking lot at the first driveway on the left. At The Bridge Bible Fellowship, we focus on the heart more than the outward appearance. 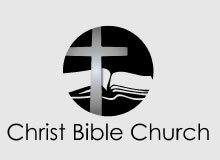 When you come to one of our Sunday services, you will find people dressed in a wide variety of styles from as casual as jeans or shorts, to as formal as suits and dresses. However, most people find themselves somewhere in the middle–most often wearing business casual. What’s Available for My Child? We know that as a parent you need be sure that your child is in a SAFE learning environment. And we know that your child is looking for a FUN place to learn. We’ve invested a lot to make sure that both of these goals are reached. You’ll see that in the volunteers who work with your child. Your child’s Sunday School classes will generally include a time of singing, an exciting story from the Bible, games and/or craft time and a snack. We take seriously the privilege we have to spend time with your child and know that we are responsible before God to make the very most of that time. 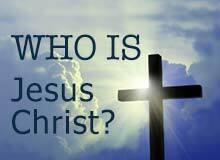 It is our goal to help your child understands how much God loves him or her and how he or she can have a personal relationship with God through Jesus Christ. What Should I Expect at Church? There are several parking spaces reserved for first time visitors on Sunday mornings. These spaces are located near the main entrance to the parking lot and are clearly marked. If you have small children, you might prefer to park in the near the E building where children’s activities are centered (see campus map). As you then enter the worship center, an usher will give you a weekly bulletin. It will have lots of information about what’s going on at The Bridge, both on Sunday and during the week. Our services include uplifting God-centered worship from both contemporary music and more traditional hymns. There will be a practical message taught from the Bible. We know that the Bible is “living and active” and able to pierce our hearts and change our lives. You will be able to use what you learn in church thoughout your week, to deal with the real issues of life and impact others for the glory of God.